As a mom to twin toddlers (almost preschoolers! ), sometimes I feel like a modern day Mary Poppins pulling out all my tricks to keep my kids entertained. I’ve found that simply getting outside and playing in the fresh air is usually all we need, but sometimes that just isn’t possible because of weather or someone not feeling well. That’s when I’m happy that I keep a bin tucked away filled with fun prompts for inside activities. I stash our Rainy Day Activity Kit in our hall closet just waiting for those times when we are stuck inside and going stir crazy. Everything inside is inexpensive, easy to find, and guaranteed to keep little ones entertained. I’ll let you peek inside my box of tricks so you can fill your own for the next rainy day. I always keep a supply of inexpensive craft items in the bucket. It’s amazing how exciting a few new crayons, a coloring book, and stickers can be! Don’t limit your creativity to coloring books though. Throw the Sunday comics or a few catalogs inside for a fresh new canvas your kids will love. 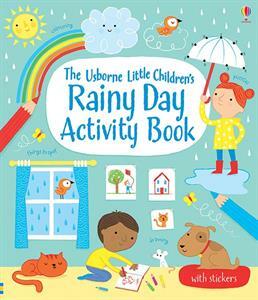 Right now we have a copy of the Little Children's Rainy Day Activity Book in our Rainy Day kit. It's filled with stickers, puzzles, drawing, coloring, and learning activities perfect for a rainy day kit or just quiet time. Before I throw anything away I think, how can my kids play with this? I keep a collection of things like cardboard paper tubes, bubble wrap, and egg cartons ready for crafting and play. We’ve turned a strip of bubble wrap into a bumpy road for our toy trucks, and paper rolls into stacking rings. The possibilities are endless and you will be amazed what your kids will invent. Check out all our recycled activities here. Tucked in my rainy day bucket is a pair of flashlights and an old sheet. It doesn’t sound like much, but drape the sheet over the kitchen table, hand your kids the flashlights, and watch the magic happen. They now have a secret fort to defend with light sabers (or a pirate ship, or a rocket…) for hours of entertainment. I recently cleaned out my kitchen junk drawer and was able to fill my rainy day bin with an assortment of old measuring cups, mismatched scoops, and containers. When we are bored, I fill up a big tray with beans, sand, or even plain water and let the boys explore. We’ve searched for bugs, created a farm with corn, and even brought snow indoors to scoop and play. Keeping all these things in one spot and readily available with prompts for creating and playing helps keep me sane on those stuck inside days, when the kids are bored and ready to get into trouble. It’s better than a spoonful of sugar but keeps our days just as sweet. Going stir crazy inside? Head out to one of these fun places to take toddlers on a rainy day! Blanket forts are always a hit on rainy days! 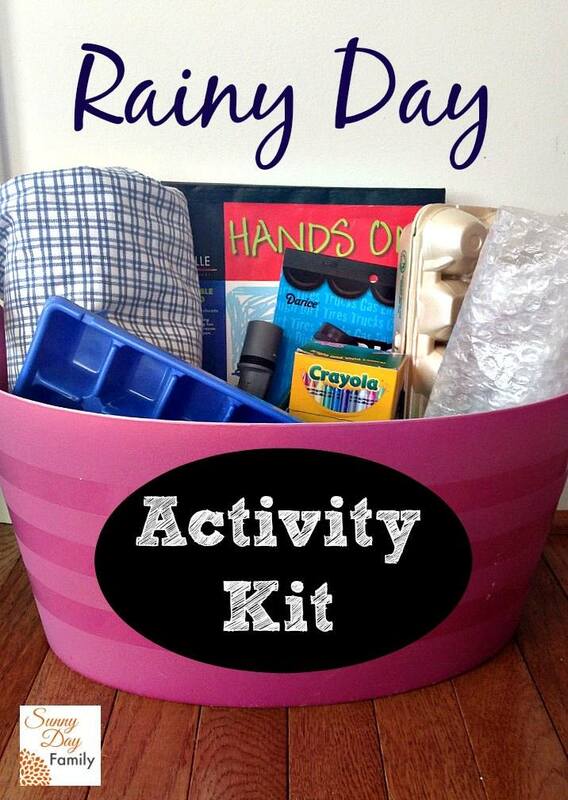 I love the idea of a rainy day basket for little ones! Some great ideas for our rainy day! Thanks for sharing on Motivational Monday. Hope to see you link up again tomorrow night! I love this idea! It would be so nice to have some station ready like this so that I don't fall apart on a rainy day and forget ideas myself haha. Thanks so much for linking up at MeetUp Monday, and hope to see you again next week! I love the idea of just one basket to the whole world of creativity for kids,little ones and even works on big children.